I love the Christmas season, and reading Christmas books is always a feature during our December celebrations. During the past two years I have wrapped books and labelled a child’s name to open each day during the advent. (See reports from 2014 and 2015 about how we did this.) I had every intention of doing this again this year. But do you know what, some years, (particularly this year!) you just can’t do everything. I think I wrapped up five days worth of books on about day 3 for a late start, and then we stalled again until this morning when Elvey, our Elf on the Shelf, brought another five wrapped books, and that will be all this Christmas. Most of this mornings books were new which also made it special since we haven’t been doing it everyday. Scholastic has gifted us with some delightful Christmas books for review, and I also couldn’t resist making a few bookclub purchases to add to our collection. 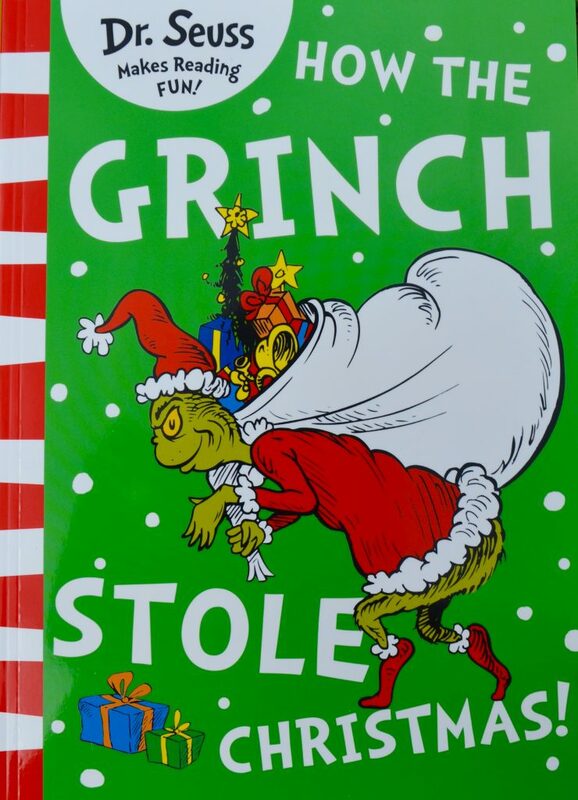 For instance, every Christmas collection should include The Grinch! Can I tell you how excited I was when I saw that Pig the Pug had joined in the Christmas festivities? VERY! I think the Pig the Pug books are just great. They had me from “Well, pigs just don’t fly” on the first book, and I haven’t been disappointed during subsequent stories. It turns out Pig is a huuuuuge fan of Christmas. I don’t know why that came as a surprise for me, after all he’s a greddy Pig, and Christmas can be associated with greed, you know all those chances to write lists and get presents as such. Anyway, as usual, Pig’s greed got him into a hilarious predicament which I’m sure would make any child laugh. The kids at my local playgroup certainly thought it was a winner when I read it to them. 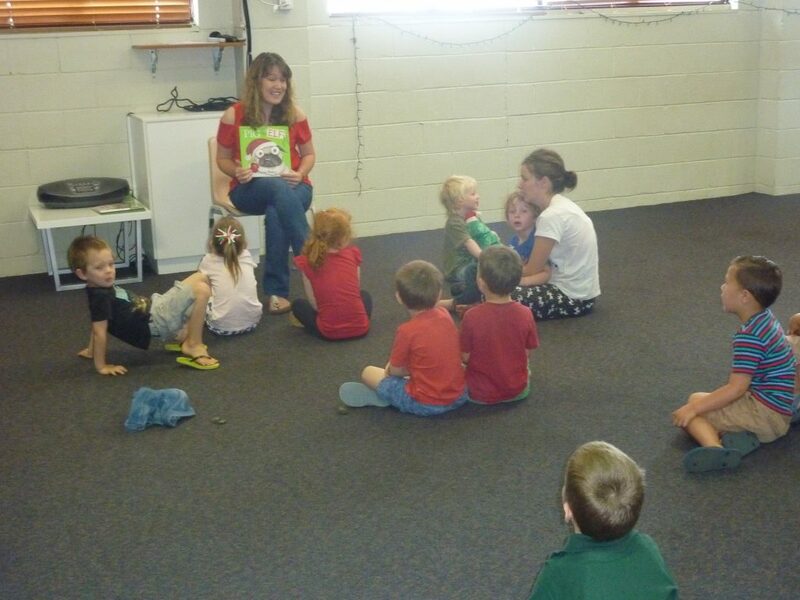 (At my final playgroup after 8 years of playgrouping before the kids start school next year. Yikes!) 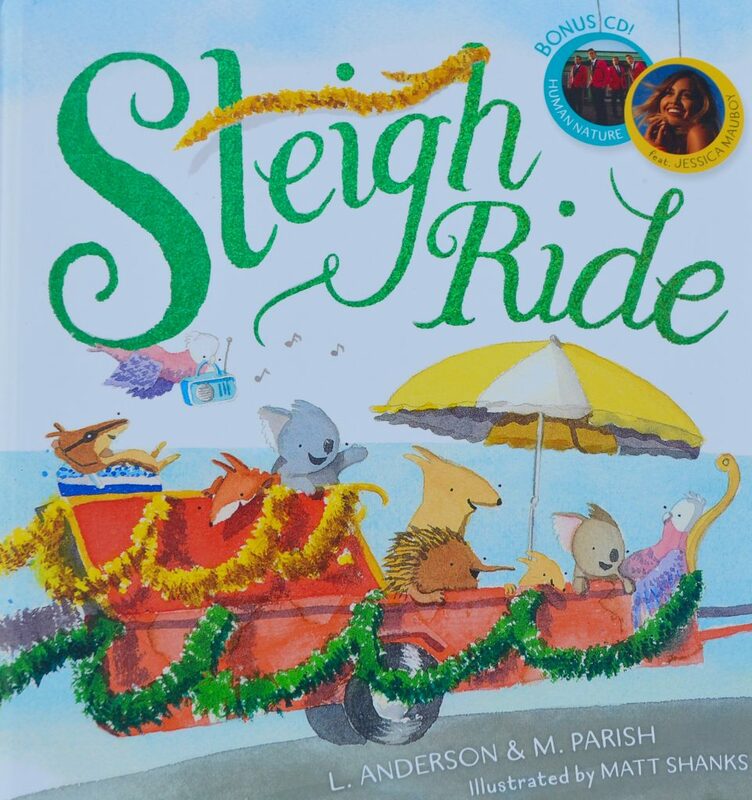 It’s a perfect book for a springboard for talking to your child about Christmas spirit, and manners! A lovely fun way to encourage thankfulness and the true spirit behind gift giving. 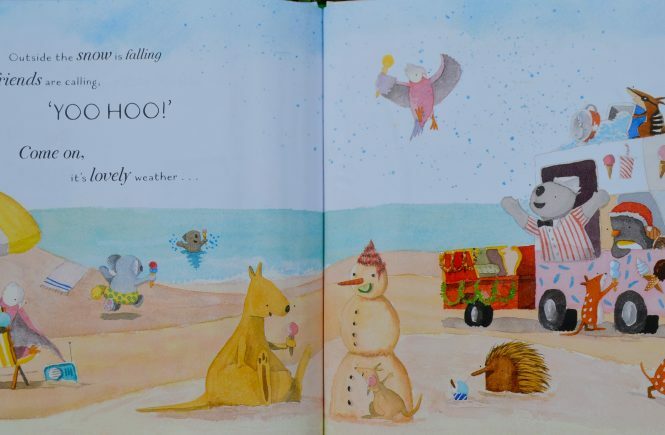 A classic Christmas song sung by Human Nature plus featuring Jessica Mauboy, you can’t beat a kids book with a song that’s easy listening for Mummy’s ears too! 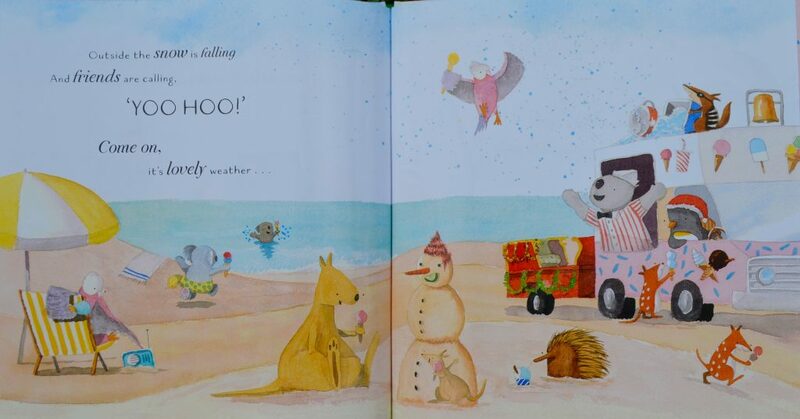 This book has wonderful Australian illustrations to accompany the song. Of course being Aussie the scene is at the beach and the sleigh is a trailer. Perfect! Not to mention the tune itself is one of the most played Christmas carols of all time, an age old favourite. I loved it that when we first listened to the CD Imogen was waltzing around the room with the cat. It’s the kind of music you simply want to dance or sing along with. I’m told this is a well known song. I have never heard of it! Should I admit that? Considering the song was released in 1953 (the year my Dad was born) I don’t know how I’ve missed it! In any case Miranda Tapsell (I do love her in the TV series, “Love Child”) has recorded a lovely rendition of the tune. Not that I’ve heard other renditions, but I’m confident it would have to be right up there! We’ve recently had a little kitten join our family. Our kids are totally smitten with the kitten, so the fact that this story features a kitten writing a letter to Santa is going to be a winner. The kids are pretty focussed on all things kitten right now thanks a new little kitty in our household. When I saw this title in the Scholastic bookclub catalogue I couldn’t resist buying what has become a Christmas children’s classic. Plus, once again there is a lovely lesson encouraging generosity and taking the focus off the things we get at Christmas and focussing on what the true spirit of Christmas is. We have so many male oriented book on our shelves, that I thought it would be nice to have one that is slightly more girly for Immy, so picked this up from the Scholastic catalogue. Plus, thanks to a delightful fairy garden at Kindy Imogen is completely in love with fairies this year. Rosie the Ruby Fairy is a delightful little story. She’s a manager of the post office at Sparkle town and uses her special ruby want to prepare all the town’s post, including the very important letters to Santa Claus. Except this year she accidentally sends the letters to the wrong place so has to hand deliver the letters to the North Pole itself. 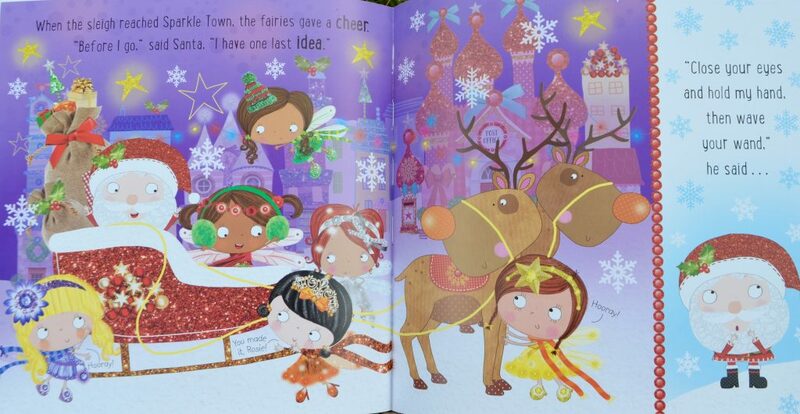 I know that even though my girl is going to be charmed by the fairies efforts, the boys will also enjoy the story also. I love that there is also a theme about being patient and persistant to do the right thing and it shows that even if we make mistakes we can fix them and move on. I highly recommend any of these books, particularly if you would like to pick up a special book to read on Christmas Eve or even tuck in a Santa sack for Christmas morning. We have also read copious amounts of Christmas library books though, so there’s always a cheap option with your pre-Christmas reading. Christmas is such a joyous way of encouraging literacy.